'We Are Wiped Out': Monster Storms Kill Scores In U.S. : The Two-Way Severe storms and tornadoes killed scores of people in southern states on Wednesday and early Thursday; Britain revoked the royal wedding invitation for Syria's ambassador; 1st quarter GDP results released today. 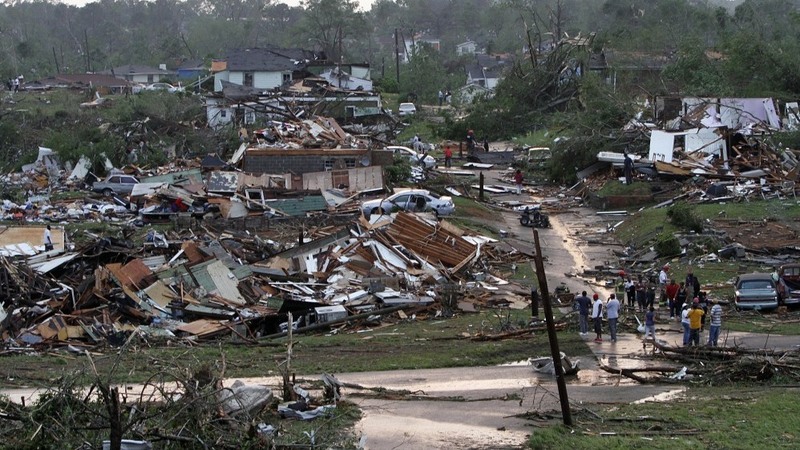 Residents survey wreckage in Pratt City, Ala. just north of downtown Birmingham, on Wednesday, April 27, 2011. Update at 9:36 a.m. ET: CNN has increased the storm death toll to 202 people. Update at 8:50 a.m. ET: The AP has increased the storm death toll to 193 people. Update at 7:55 a.m. ET: USA Today says the storm death toll is now 178 people. The line of deadly storms is tearing northeast to the Mid-Atlantic states. Our original post: It's dreadful news from Alabama, where 128 people have died. But the death toll is even worse: CNN says at least 159 people are dead from horrific storms and tornadoes pulverizing the region. As The Atlanta Journal Constitution says 11 people died in Georgia. The Jackson Clarion-Ledger's Headline reads 'We Are Wiped Out'; the Mississippi newspaper says at least 11 people were killed in storms but there are indications the death toll may be three times that number. In other news, Britain has revoked the royal wedding invitation of Syria's Ambassador; the Telegraph says the Syrian diplomat's presence at the nuptials of Prince William and Kate Middleton would be unacceptable following the killings of Syrian democracy protesters at the hands of Syrian troops. The Commerce Department releases its snapshot of U.S. economic growth in the first quarter of this year. Reuters predicts growth slowed way down, because consumer prices went up between January and March, especially prices for gasoline and food.